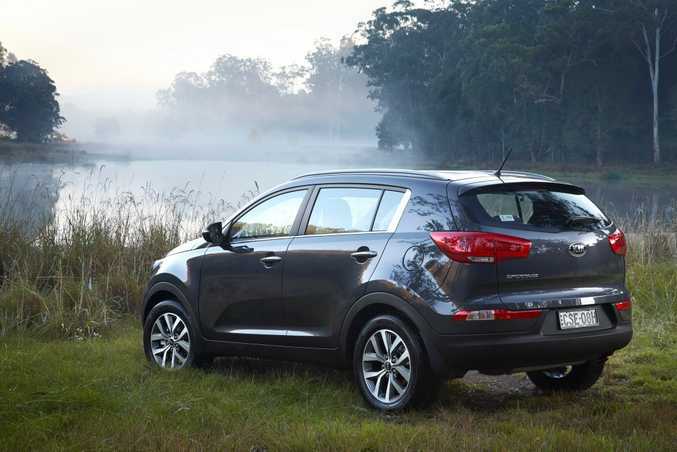 The Kia Sportage Si Premium. 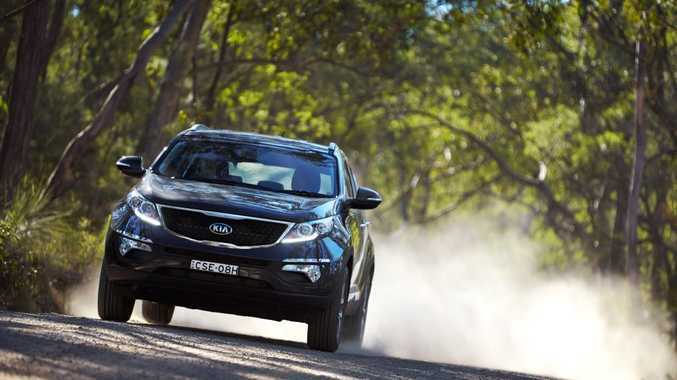 KIA has expanded its Sportage range, giving the popular SUV an enthusiastic burst with the Si Premium. Offered as a two-wheel drive petrol, the new addition has a number of new inclusions and a slightly tweaked exterior look. Manufactured at Kia's plant in Slovakia, the Sportage increasingly has a decidedly more European feel despite its South Korean roots. 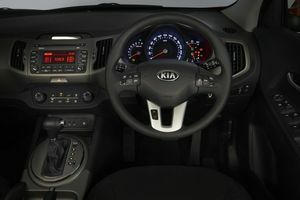 Inside, the Si Premium is pretty standard Sportage, with a wide, user-friendly dash and large buttons and dials exactly where you would expect them to be. It seems a bit dark, though, with blacks and greys the hues of choice for the trim and materials, perhaps making the car feel smaller than it is. The front seats are quite comfortable and supportive, the bench-like rear a bit less so, with leg and headroom also favouring front-seat occupants. The higher riding position helps visibility and offers that sense of confidence, especially on fast-moving highways, misguided though that may be. Plastics are not always soft to the touch, but the fit and shape is good and we heard barely a rattle during our week in the Si Premium. There are plenty of storage options around for small families, including useful door bins and cup-holders that actually fit standard take-away coffee cups. The boot at 564 litres, growing to 1353L with the rear seats lowered, copes well with a weekly grocery shop along with the school bags and musical instruments in one go. The Sportage Si Premium is powered by a 2.0-litre four-cylinder direct-injection petrol engine with drive to the front wheels only. On the whole it is an able unit, showing a willingness to extend itself even if the execution isn't always bang-on. strength, but the petrol engine is not always the most powerful. It strains when effort is required, especially up a hill or when a burst of speed is needed - the engine quite plainly searching for the right gear - but steadies easily when calm is restored. It is quick enough once it gathers pace, but will complain while doing it, especially when the Eco mode is selected. This SUV is easy to steer, behaves around corners and brakes well when the need arises. The main competition in this tight segment includes the Toyota RAV4 (from $28,690), Mazda CX-5 (from $27,880), Hyundai ix35 (from $26,990), Nissan X-Trail (from $27,990) Mitsubishi Outlander (from $27,740), Volkswagen Tiguan (from $28,490) and Ford Kuga (from $27,990). Demand for SUVs of this size continues to grow, with the 2WD option adding to that bottom line. This Si Premium has many of the things customers in this segment demand - decent space, good features, striking looks and a capable drive - so it will no doubt pique the interest. The improved equipment level and subtle changes to the exterior will add to the attraction. It is good to have the reverse camera, but it would be even better with a 17cm screen rather than in the rear vision mirror. Hopefully in the next Sportage update, consideration will be given to the comfort and shape of the back seat, which is okay for kids ensconced in their own car seats, but not so much for adults who have to share the pew. Fuel economy was improved when the range was revised, with figures for this 2.0-litre petrol engine at 8.4 litres/100km. We think this figure is quite high as it is, when compared to some rivals, but struggled to get better than 9.8 litres/100km even with the Eco button selected for much of that time. The diesel is the best option for those wanting thriftier consumption. When it comes to warranties, Kia is beautifully generous, with a five-year unlimited-kilometre deal and fixed-price servicing. Subtle exterior changes, including LED daytime running lights, LED rear lights, new alloy wheels and roof rails, have merely enhanced the Sportage's athletic yet curvy look. Model: Kia Sportage Si Premium. Details: Five-door two-wheel-drive medium-size SUV. Engine: 2.0-litre four-cylinder direct injection petrol generating maximum power of 122kW @ 4000rpm and peak torque of 205Nm between 1800rpm-2500rpm. Consumption: 8.4 litres/100km (combined average). Bottom line plus on-roads: $29,990. What we liked: New inclusions, striking looks, reverse camera. What we'd like to see: More vroom from the petrol engine and larger screen for reverse camera. Warranty and servicing: Kia offers a five-year unlimited-kilometre warranty with fixed-price servicing. Service intervals are annual or every 15,000km. Average price for the petrol is $379.